With 100+ workshops from more than 30 presenters our goal is to help you Narrow Your Focus or Expand Your Horizon. Peruse the navigation bar on the left to see how all this information is organized. Workshops are listed in alphabetical order by Title with their presenter and description. To see workshops by a particular presenter, choose Presenters on the top row navigation bar and look up the presenter. Their workshops will be listed under their bio (this website is constantly being updated and the listings don't really settle down until about March!). Just because no 2 browsers act the same way with regards to caching and history, please hit the Refresh button on your browser to make sure you have the latest page. Workshop Times: Unless otherwise noted, workshops are 90 minutes. We have 3 main workshop periods on Friday and Saturday: 9:30-11am (AM1), 1:30-3pm (PM1) and 3:30-5pm (PM2). On Sunday the morning workshop starts at 9am. 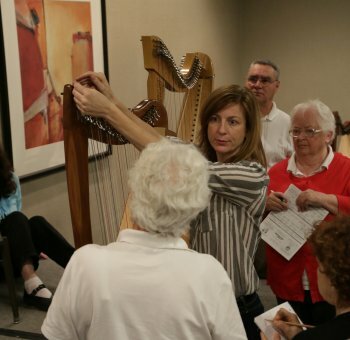 There are mini-workshops scheduled in the 11am-1pm lunch break when we do things like the Harp Tastings and Do It Yourself Harp Maintenance. How you get into a workshop: You can drop into any of the other workshops. We estimate how much space we need for each presenter and workshop and most of the time it all works out and there are seats and enough room for everybody. In consideration of others, please try to get to your workshop a few minutes early to give yourself time to get a seat and get settled. We have a few classes that we ask for advance sign-up, but other than that, you're free to pick whatever you want. Thursday workshops: Because we have a smaller number of workshops on Thursday which are specifically targeted to playing levels, we ask that you sign up for any Thursday workshops in advance. This gives me an idea of what size room to arrange and enables us to make sure we enough handouts for everybody. There is a section on the Registration Form for you to mark your choices. You can always change your mind later and just email me with changes. Other tools: Under the Schedule Downloads (on the left) we have 2 downloadable file types to help you put your Somerset itinerary together. You can download an Excel file and then sort and filter this file any way you like: by day/time, by presenter, by workshop title. You choose. The PDF file is a static snapshot of our spreadsheet file that you can print, read and highlight offline. HOW THE DOWNLOAD FILES ARE SORTED: By the column heads, first by day, then by time period (the key is AM1= 9:30-11am, AM2=lunch period, PM1=1:30-3pm and PM2=3:30-5pm), then by title. Sorry about the key acronyms but that's really the only way I can see to sort the list and have it come out in the right sequence. Workshops are aggregated into some topic-specific Focus Area pages to make it easy for you find workshops to Narrow Your Focus. You'll find the Focus Areas on the left navigation bar under this Workshops tab. If you have Excel, the spreadsheet version of the workshop schedule will have columns for these topics so you can sort and filter by topic. Levels: these are suggestions, not edicts. The presenter may have a target audience in mind but that doesn't mean you can't get in over your head. Likewise, something may be targeted to a Beginner, but if it's new to you and you're interested, take it! Hands-on: this means you should bring a harp! 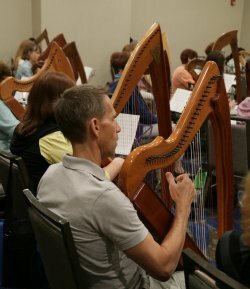 If you don't have a harp, you can still sit in on the workshop and learn something. Lectures/Musical lectures/Demos: no harp is needed. All lectures are open to registered non-harping companions. Please non-harping companions, do not take up space in a hands-on class! First priority in those classes goes to the players. Workshops Taught By Ear: Workshops that are being by ear are marked as such. This means that no sheet music is given out at the beginning of the workshop: but it may be distributed at the end of the workshop. You are encouraged, particularly if you do not usually learn by ear, to record the workshop as a memory jog for later. If you learn primarily by reading music, these workshops might be challenging for you, but we encourage you to stick it out and try it. Please do not dun the presenter for the music at the beginning of the workshop. Your ears will not be open if you're focused on looking at sheet music. Accessories: these are optional and suggestions from the presenter. Recording devices are permitted as noted, but these recordings are for your own personal use (in other words, don't post them on the internet). --Turn off your cell phone or put it in vibrate mode. Do not talk on cell phones at all during the workshop. --Arrive on time and be in tune. --If you arrive late, come in quietly and without fanfare. If it's a hands-on workshop in progress, please take your harp out of the case outside of the workshop room to be less of a distraction. If you arrive late, certainly never shoehorn yourself in to sit in front of someone who got there on time! --Unless it's a workshop about noodling, do not noodle (you know what we mean!) or otherwise pluck at your harp while the presenter is talking. It's distracting. Do you have a harp or music product to sell? Get a booth or table at the festival. Call Kathy 856-795-7637. Workshop descriptions and schedules are subject to change. Please always Refresh your browser when you come back to visit the site in order to see the latest version of the page. Copyright 2019, You Gotta Have Harp Productions. All rights reserved. All logos, trade names and trademarks are the property of their respective owners.